Every once in a while I make a recipe that I want to climb to the rooftops and shout about how great it is. And that’s the case with the high protein Christmas cookies. Even more so when you consider the calorie and macronutrient content. Cookies with 8 grams of protein and fewer than 100 calories aren’t supposed to taste good, right? Wrong. 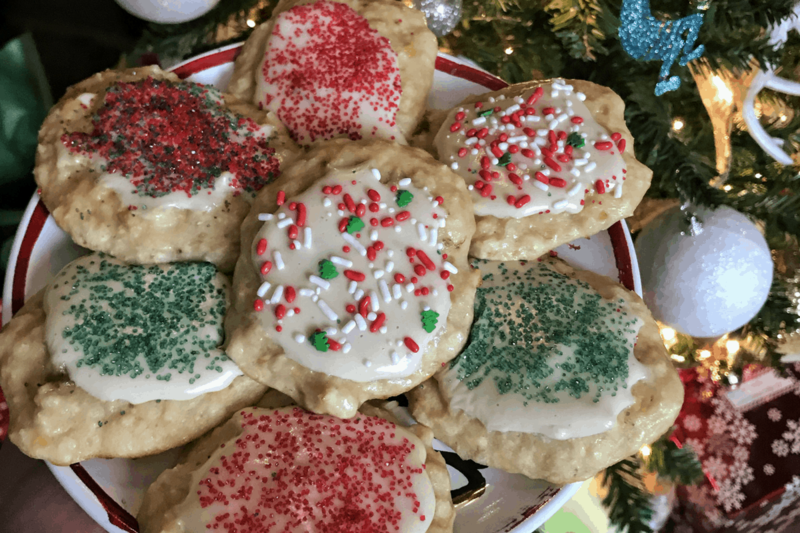 These Christmas cookies are the perfect combination of sweet and almost savory thanks to a core ingredient. I haven’t even mentioned the part about the possibility for peppermint protein frosting. 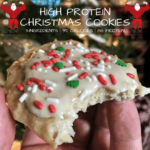 That’s right, you can customize your high protein Christmas cookies with either of the frosted sugar cookie or candy cane variations. 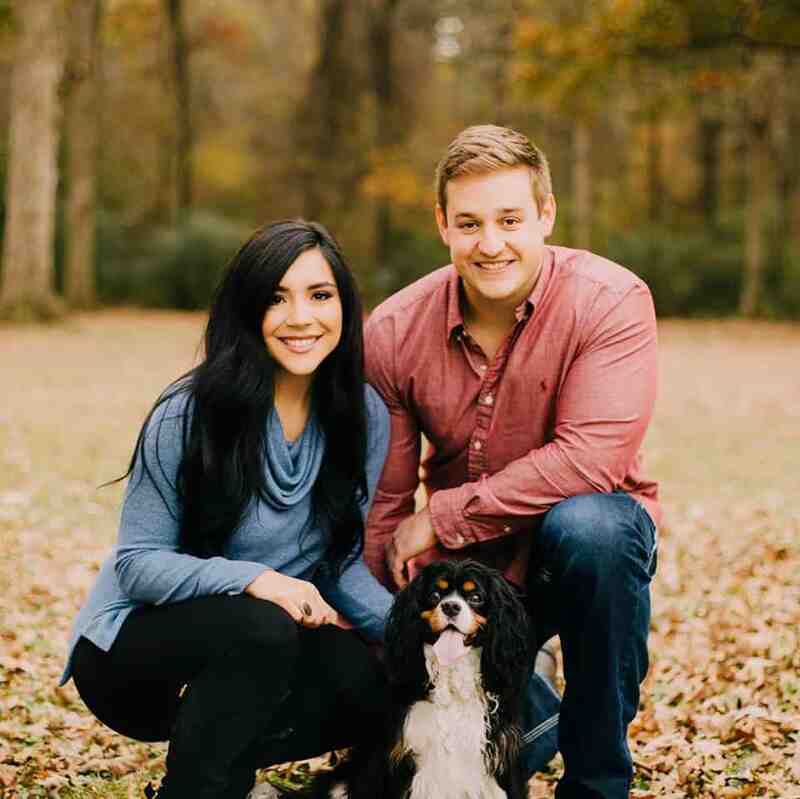 And if you’re reading this outside the month of December, the base recipe can be used year round to make delicious 3-ingredient cookies for any occasion. With 3 core ingredients, this should be a quick ingredient run down. You’ll need bananas, coconut flakes, and protein powder. Das it mane. For the bananas, I mention in the recipe to use small bananas but also give the weight in grams for precision. If you don’t have a food scale, the bananas I used were around 6 inches in length. I used Baker’s sweetened coconut flakes, and I must say, this stuff is gooood. I can’t wait to try more recipes with this ingredient. That’s it for the core ingredients outside of protein, which I’ll touch on below. 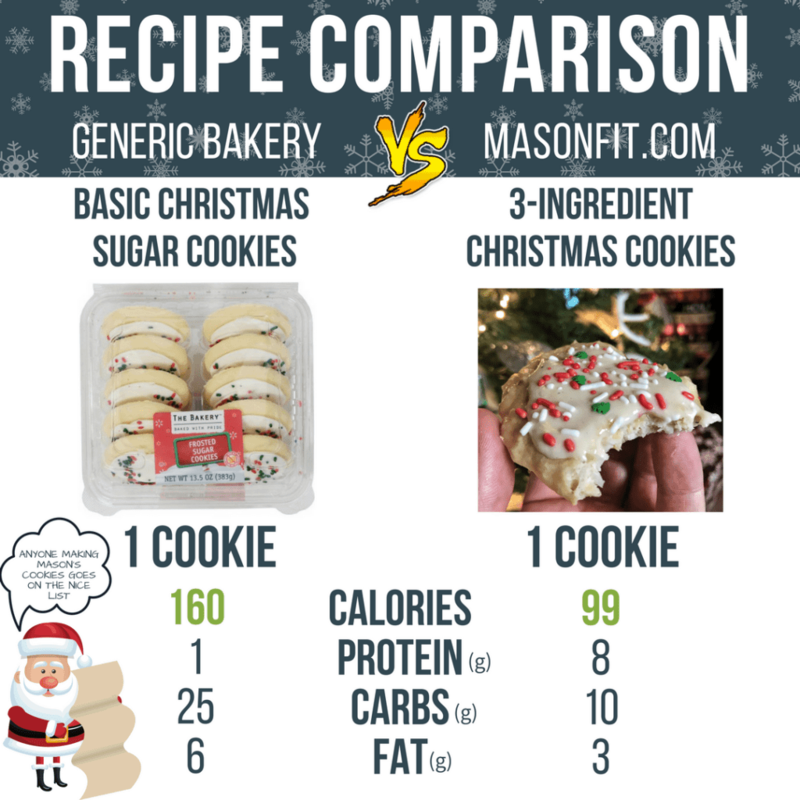 You will, however, have to decide whether you want your high protein Christmas cookies to be a candy cane or frosted sugar cookie flavor. You could always do both, and I give instructions on how to make the candy cane version with peppermint extract in the recipe. One thing I don’t mention would be including crushed candy canes on top of the protein frosting. This gives your Christmas cookies a crunch factor that puts them over the top. Highly recommend picking up some candy canes if you plan on making the peppermint or candy cane variation. And like I mention in my Christmas Cake Donuts recipe, you can be as festive as you like with the sprinkles, just be sure to account for them in your macro calculations. I used a Christmas-themed combo pack from Amazon. A super simple recipe for high protein Christmas cookies that will blow you away. Peel bananas and mash with a fork or spoon before adding coconut flakes and protein. Mix until smooth. Spoon (roughly 2 Tbsp) mixture onto baking sheet in 12 small circles. Leave enough space between for some expansion during bake time. If you need to use two baking sheets to spread them out, that's fine. Bake for 7-8 minutes or until the tops are no longer mushy or moist. Remove from oven and allow cookies to cool briefly before adding frosting. Add frosting and sprinkles if you'd like and enjoy! 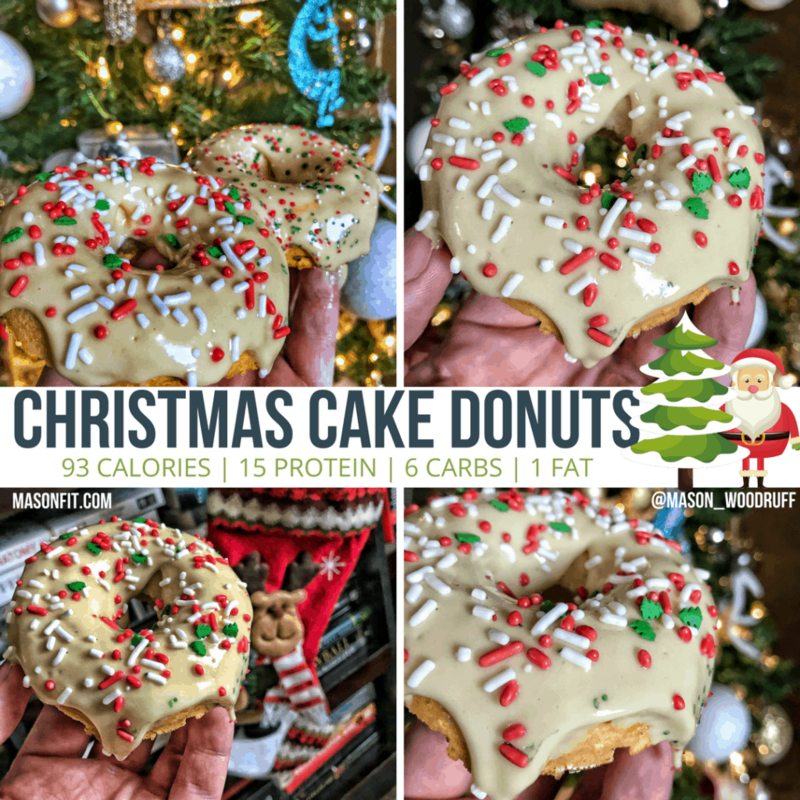 If you like these cookies and want more Christmas-themed macro miracles, check out my Christmas Cake Donuts recipe (pictured above). And as always, I want to see your re-creations on Instagram. Be sure to tag me if you try any of my recipes and I’ll be sure to share it with everyone! One last thing before you go. 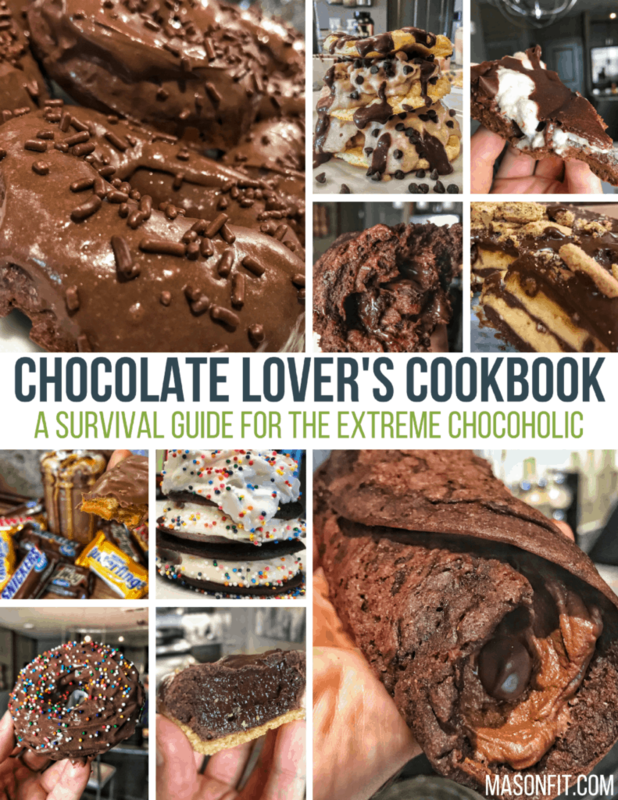 I have a free cookbook for chocolate lovers that I think you’ll enjoy. You can download it for free here or simply enter your info below and I’ll send a copy to your email.